The Twentieth Judicial District Commission on Judicial Performance unanimously recommends, by a vote of 9-0, that that Judge Ingrid S. Bakke BE RETAINED. One commission member was absent. Judge Bakke received her undergraduate degree from the University of Colorado in 1985 and her J.D. from the University of Denver in 1990. Prior to joining the District Court she was in private practice focusing on criminal defense, dependency and neglect, guardian ad litem, and delinquency cases. 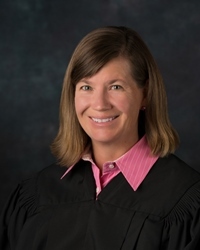 Before entering private practice Judge Bakke served as a Municipal Court Judge for the City of Lakewood, a Chief Deputy District Attorney for Boulder County, and a Deputy District Attorney for Jefferson County. She has taught nationally and internationally on trial skills and the prosecution of sexual offenses. Judge Bakke was evaluated through the following methods: anonymous attorney surveys, anonymous non-attorney surveys, self-evaluation, unannounced courtroom observations, review of several written decisions, and an interview. The commission also held a public hearing to solicit input on all the judges who are up for retention. Attorneys and non-attorneys graded Judge Bakke well above average relative to all district court judges, statewide. Although there were isolated comments critical of Judge Bakke, the overwhelming majority of comments and opinions were very positive. Of all the attorneys surveyed about retention, 89% recommended to retain Judge Bakke, 6% not to retain, and 4% made no recommendation. (These percentages may not total 100% due to rounding.) Of all non-attorneys surveyed, 93% recommended to retain Judge Bakke, 1% not to retain, and 6% made no recommendation. Judge Bakke estimates that approximately half of her time is spent in civil proceedings, 25% on juvenile issues, and 20% in probate court. Those surveyed commented that Judge Bakke’s decisions were easy to understand, that she maintained control over her courtroom, that she was courteous to participants, and that she accurately and appropriately applied the law. Of particular note, the professionalism and even temperament of Judge Bakke were consistently referenced. The Commission was impressed with Judge Bakke personally, through her interview and self-evaluation, as well as with her community service of coaching a high school mock trial team and judging mock trial competitions. It is clear that Judge Bakke gave attention to any negative feedback from the surveys and reflected as to how she could improve her service as a member of the judiciary. Judge Bakke is diligent and hard-working and has earned her reputation for excellent legal acuity through continued efforts to remain current in all aspects of the law.